Christmas is a time which has long been associated with a very particular type of decorating. Gold and silver tinsels, brightly coloured baubles and twinkling fairy lights in an array of different colours are all staples of the traditional Yuletide design standard. But for many modern interior design enthusiasts, these types of decorations can be more jarring than charming. It stands to reason then, that over the years there has developed a distinctly separate attitude towards Christmas decorating which has sought to combine all the merriment of the season with all the aesthetic chic of modern interior design. For people who embrace this attitude it’s often the case that less is more, both when it comes to the abundance of decorations in their homes and to the variations in style and colour. In line with many common interior design techniques, decorating for the modern Christmas often means taking inspiration from both the aesthetic traditions of the season and also from other artistic and cultural influences. For example, a person might create a Christmas decorative theme for their home by combining traditional elements – such as the Nativity – with a modern, neutral colour palette. It’s also fairly common that homeowners will create their Christmas decorating scheme based on the existing aesthetics of their homes. A home furnished with beautiful pieces from The French Bedroom Company, for example, would be at odds with the often excessive gaudiness of flashing lights and glitter. And it would be more usual for a family home to be decorated in a theme to suit children – featuring Santa, elves, etc. – than that of a single person or childless couple. The easiest way to out together the perfect Christmas look for your home is to first pick an overall theme. This will help you to seamlessly meld all of your choices together and create an aesthetic which flows throughout your home. You might decide to allocate a different colour to each room, or to pick a palette which can be used together throughout your house or apartment. As well as considering these factors, it’s also important to take stock of what’s important to you about the festive season. Do you like the traditional decorative elements, or do you prefer a cleaner look? Do you have a favourite childhood decoration which you can use as the basis or your design, or would you prefer to begin from a clean slate? However you choose to decorate your home this Christmas, don’t forget to make it personal to you. After all, nothing says chic like originality. Oh my goodness…choosing Christmas decor for the home is so much fun but tricky at times! I find that you almost have to stick with the same colour and theme for a few years to make it worth the expense and the storage space they take up all year round! I know what you mean Katie. We’ve been building up a collection for several years but last year had a bit of a revamp last year. Not a total one though, just a mini update. I’ll be sticking to that theme again this year that’s for sure! I agree with Katie – I’m in awe of those that appear to update their Christmas “look” every year! 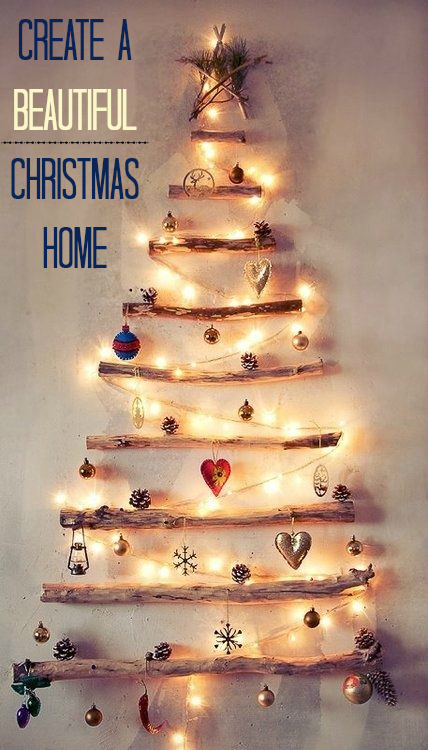 I’ll never thank Pinterest enough to be my first inspiration for home decoring like this tree ! So many cheap tricks for wonderful DIY decoration ! how do you get it to stick to the wall?? I absolutely LOVE the tree idea in your photo. amazing.. This looks like a Christmas tree. I will definitely try this . That really very amazing. I loved it. Keep sharing. That decoration is amazing.. not TOO long to go, might have to start thinking about things soon! What do you have for 2016 Christmas,Three years on since this post.I love your though though.